From 150L - 225L Tanks with mounted booms up to 4M. Complete with 12v pump and optional 30m hose reel with spot lance. 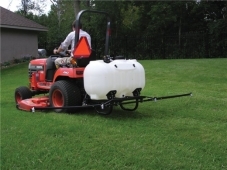 A perfect estate sprayer for compact tractors. Delivery charges for this product depend on location, and could be free. Simply select "enquire" above and enter your email address and we will contact you with our best delivered price.